Ocean Play Mat Options – Which is Best? What do you use for a play mat? I’ve used a sheet once but it bunches and moves. Neoprene playmat? 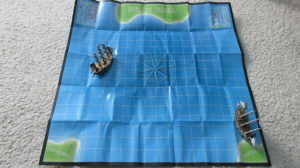 I don’t quite have a favorite ocean play mat, but I’ve used many great options in the past. 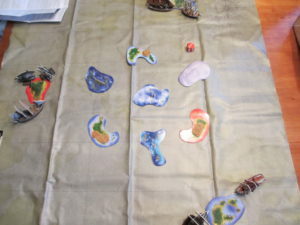 In this post I’ll answer this question in detail, providing pictures and analysis for the ocean play mats that I use. This is the mat that comes in European packs of Spanish Main (Unlimited Edition). Gale Force Nine released a vinyl map that you can see here. Probably the most “famous” is from the Plunder Pack. However, it’s both the least appealing and not very practical. Although I DON’T recommend the map, the Plunder Pack itself is quite cool. 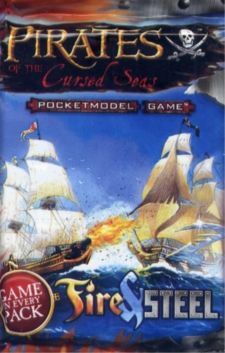 The Plunder Pack map – dull, gray, boring, and prone to excessive creases from folding in storage. 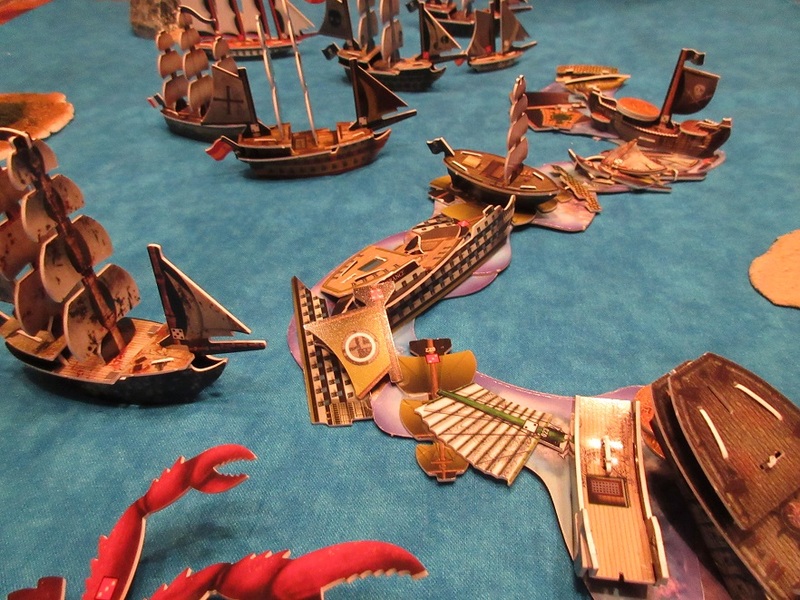 Although the above ocean play mats are better than playing on less nautical surfaces (such as a wooden table or a random rug or carpet), it’s both cheap and effective to get something that really beautifies your games. The answer? Basic chunks of fabric. In 2015 I went to Joann Fabrics and bought 5 different yards of blue fabric for a grand total of about $17. 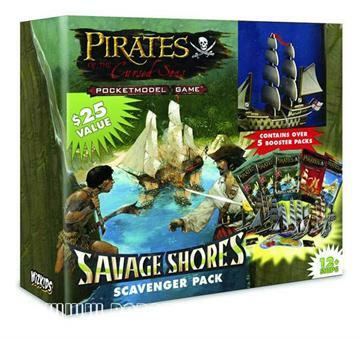 At about $3/yard, I can honestly say it was one of my “best buys” of Pirates CSG ever (despite not buying any actual Pirates stuff) and transformative for both my games and associated Battle Reports. Since that awesome purchase, I’ve used almost nothing else in my games. I’ve attempted to rank them here. This is a light blue fabric that makes you feel like you’re playing a game of Pirates CSG in the Caribbean! I call it a “textured” fabric because it’s not a solid blue color, with some variation throughout to make it look a bit more like real water. The English and Spanish feel right at home in the “Caribbean”! This one is by FAR the most unique ocean I have. It’s a completely different material than the other 4 fabrics I use, making it quite distinct. It’s silky, smooth, shiny, and cool! It doesn’t fold like the other fabrics, being much more susceptible to sliding around in your hands. However, you can still wrap or fold it up easily for storage. This is just like the “Caribbean blue”, but with darker shades of blue. Creates more of a “deep sea exploration” feel as compared to the more tropical light blue. Darker version of the other textured blue fabric. This solid colored fabric is a little more “boring”, but still provides infinitely more thematic element than the brown table below it. 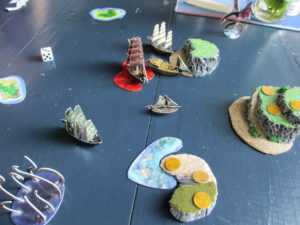 Starting setup for an “Other Worlds” game. More of a “navy blue”, this may be the most boring of the bunch, but it still turns Pirates CSG into more of a seafaring experience. 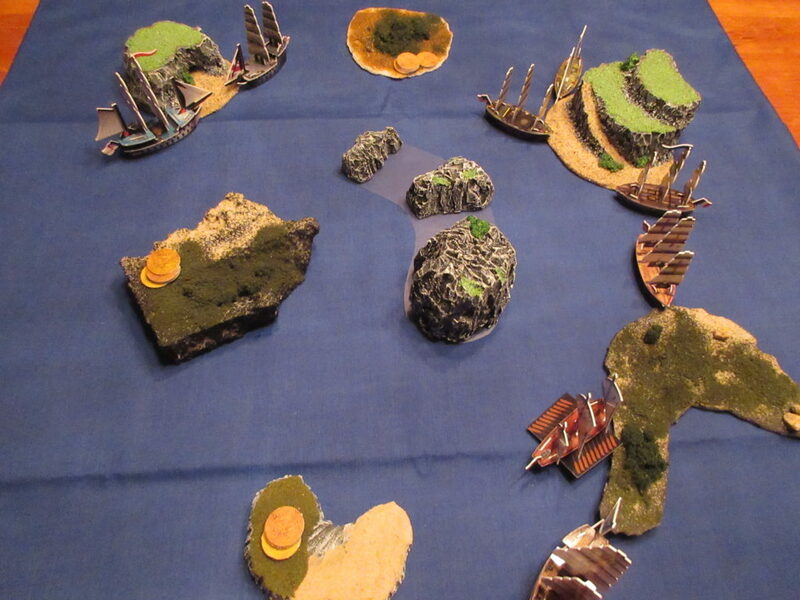 Custom islands and terrain can enhance your games even further! If you’re like me and occasionally need a larger ocean (or oceans), there are still various options. You can use a blue bedsheet that you may have lying around, or bought for cheap. 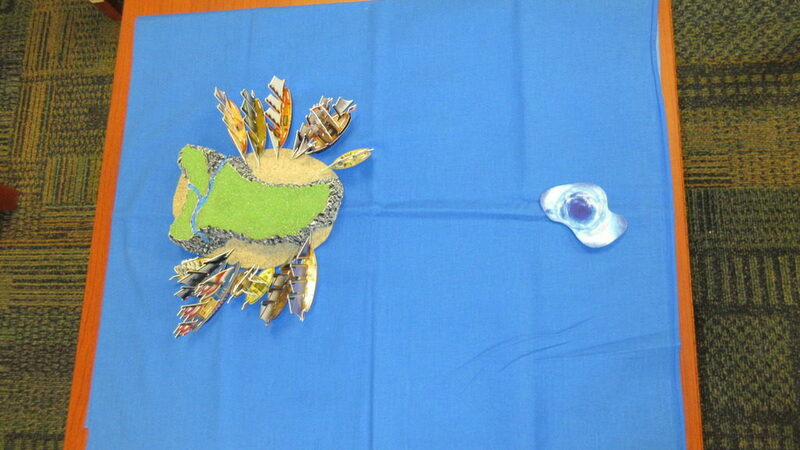 You could also buy more than a yard of fabric – 2 yards would give you quite a lot of space. 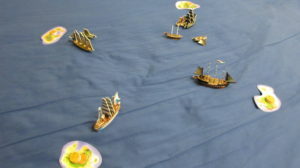 To avoid any extra purchases, you could also simply connect multiple (different) yards of fabric together to create one ocean. This has the added benefit of creating a “separation” of ocean colors/textures on your map, which can be great for designating a more tropical look or a more menacing deep blue Pacific look. Those with a blue table are in luck! Playing on a blue bed sheet works just fine. Not my favorite, but this light blue-gray bed sheet is alright. 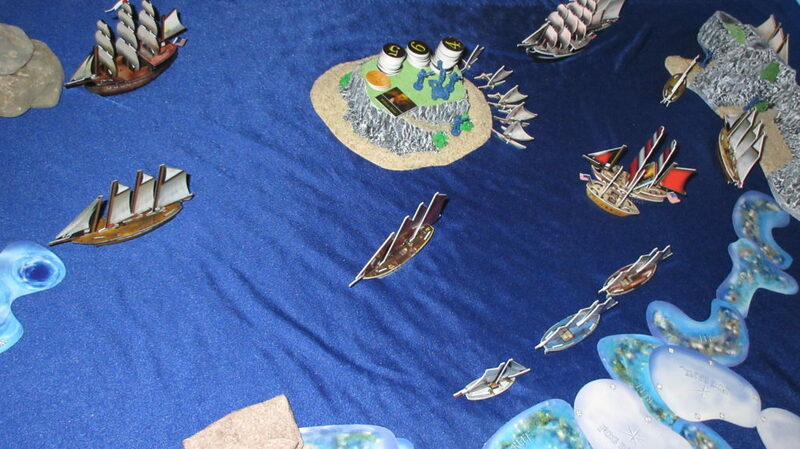 Combination of bed sheet and fabric yard used in the Sea of Allost (Command the Oceans). 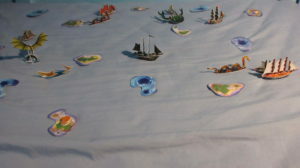 Which ocean play mat is your favorite? Do you generally prefer lighter or darker colored oceans? Comment below and I’ll respond! Feel free to even rank all of them if you’d like. -Is this the best place to go for locating the patents that are relevant to Pirates CSG? On that list of 12, only the bottom/least recent 5 were filed before Pirates went into production. However, I can’t seem to find much info on which patents are relevant to Pirates specifically. I’m trying to figure out when the patents related to Pirates expire. I started with this, and also found this page. This patent seems to list the first two (bottom in the list) patents of the 12 as being relevant to Pirates. Also, patent number 6,899,332 has two expired “parents”; does that matter? Also, it appears that anyone can pay the maintenance fees, even as a “guest”. Shocked How does that work? Does the payer receive the right to the patent or does the company/legal entity still “own” it? Is this research going anywhere or am I way off base? Do we know when the company’s exclusive rights to the property expire? Probably not for a while. After some reasonably deep digging last year, I MAY have located the patent or patents that apply to Pirates. It seems that this latest “11.5 Year Window” is the last one listed, but I don’t know what it means or when it potentially expires. An expired patent can only be renewed through an act of Congress, and in rare cases, a patent may be extended for a few years. So hopefully that wouldn’t happen. XD But I don’t know if there are other ways for them to get around it and find loopholes. So at this point, we should “share our enthusiasm”! 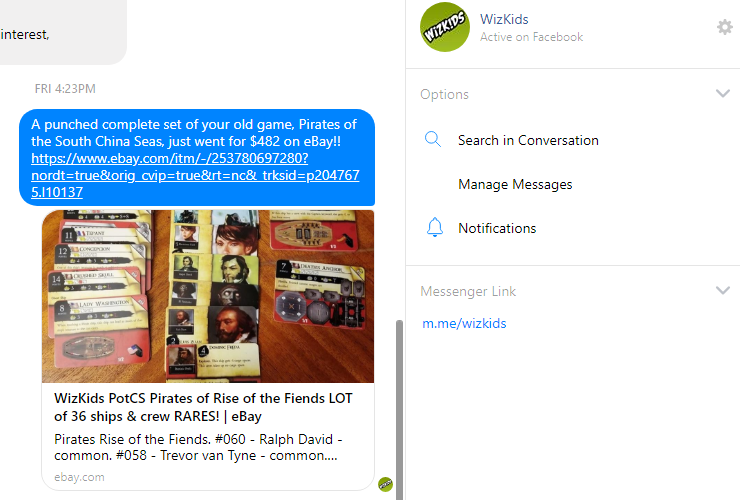 I am about to head out for a while, but plan to message NECA and Wizkids on Facebook (and possibly elsewhere) once I get back later. Please leave a comment below with your thoughts on these issues! In addition, if you have any potential solutions, go ahead and share! Additional questions for the legal side of things that I haven’t thought of are also welcome. I will respond to all comments and questions. Thank you!! 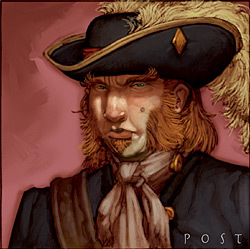 Captains and helmsmen are the most important. I’m not the biggest fan of explorers but they can be quite good as well. In terms of named crew, anything that gives extra actions is extremely good (SAC/EA/SAT/etc). It does depend on my strategy and the ship though. Empty gold runners can work pretty well, but you’re not going to have an “empty gunship”, so a lot of times the percentage of crew in a fleet is massively biased towards gunships (meaning 75-90% of crew points spent could be assigned to gunships, for example). 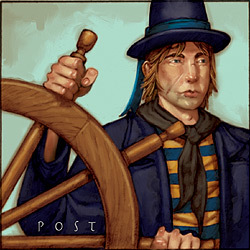 Specifically, if a ship has a base move of S+S or slower, she nearly always needs a helmsman for your fleet to stay competitive (exception is empty gold runner that gets +S with no cargo). Even the recent Savage Shores anniversary game is a good example of this. Gunships always need captains, and almost always need helmsmen too. I cannot emphasize this enough. 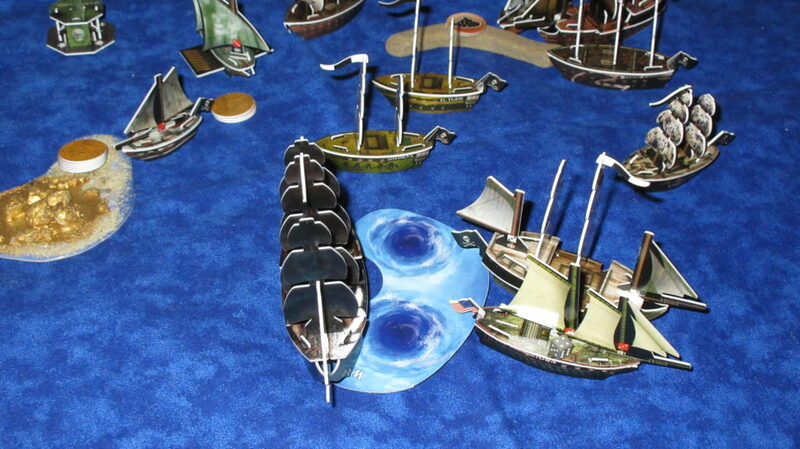 If you don’t use captains and helmsmen on your gunships, you will not win against competent opponents. However, a gimmick fleet might go with very little crew or many “abnormal” crew that don’t get pure results, but are VERY fun to use. 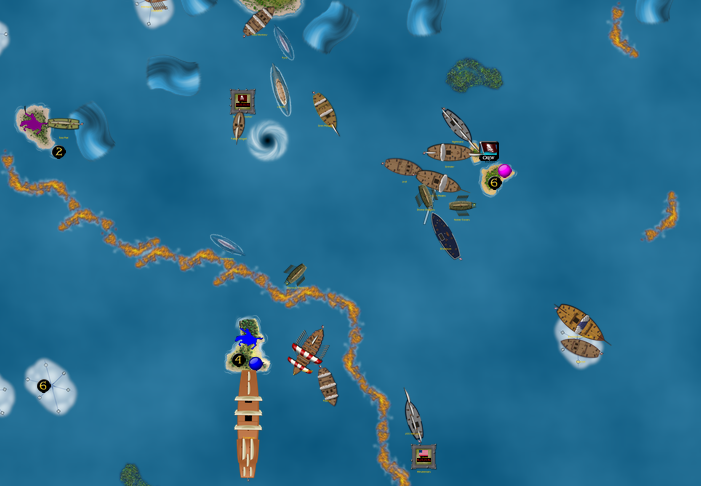 These fleets often still use captains and helmsmen as a “backbone” of sorts, in addition to the wacky stuff that make them fun and unique. 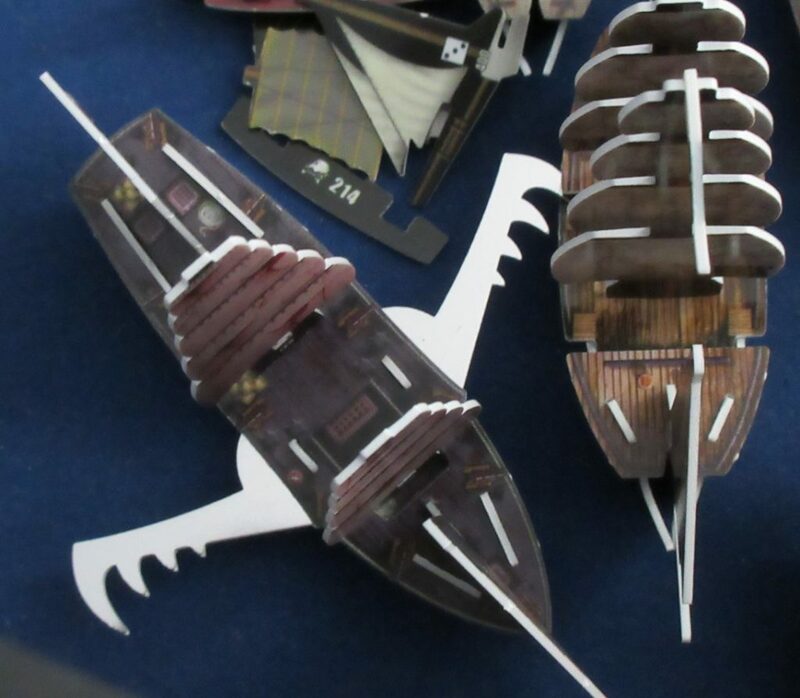 That said, if you’re strictly looking to WIN, you’re better off hammering the basics to ensure optimized fleet building. 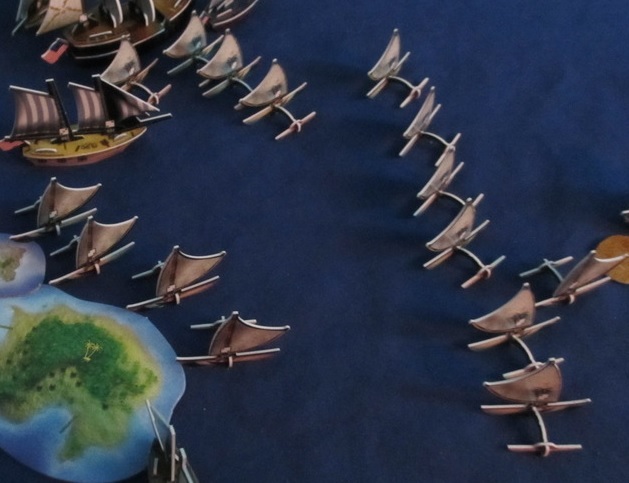 Personally I get a little bored of winning with the same fleet or strategy all the time, so I like to change it up! 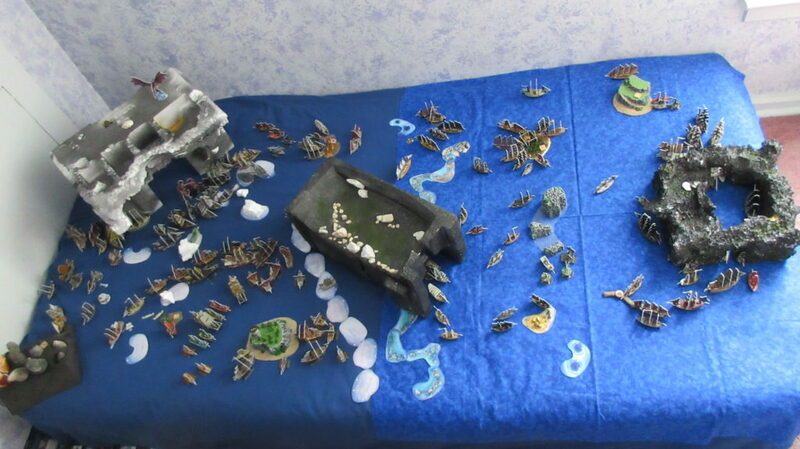 Check out my Building a Fleet page and Gameplay page for more information. You may also find some specific crew on eBay. Unsinkable ships – Eternal no more! This is the first in what could be a nice long Q&A series. From my Eternal keyword video. Is there absolutely no way to eliminate a ship with eternal built in? And if no does this cause any gameplay issues for smaller games or against opponents with a small variety of ships? Eternal is underpriced by a point or two, but it’s not as powerful as it sounds. With the right tools and strategy, it’s not a big deal to counter. Best way to sink an Eternal ship permanently is with a canceller. Cancel the Eternal ability right before you take the shot to sink the ship. 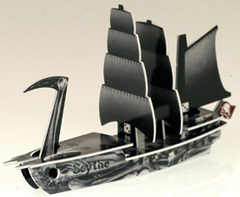 You can also capture Eternal ships and use them against your opponents. Just keep in mind that you’ll need to eliminate any oarsmen on the ship first, since they prevent dereliction and therefore capture. This is one of my favorite ways of dealing with Eternal because you can capture an enemy ship instead of “sinking” it and then immediately scuttle it and try to warp it back to YOUR home island instead of theirs! I was able to do this in CG3. There are a few niche things you can use to make Eternal less effective too – simply leave the ship with no masts and refuse to sink it. Or use the Periscope UT to cancel the ability like you would with a canceller. If you don’t have many tools available to help you with the above methods, simply sink the ship as quickly as possible and try to win the game before it comes back. Repairing an Eternal ship to any level of respectable health (likely 3+ masts for any gunship) can take a while. Not to mention how long it will take for the ship to get back in action. By simply blasting the ship away each time it approaches, you can minimize the threat by keeping it repairing at home rather than causing chaos on the battlefield. The tricky part is when you combine Eternal with other defensive stuff – such as a submarine with a canceller aboard as well. Think USS Mercury with both Ralph David (Eternal) and DNT (Canceller), with an oarsman. That’s when it gets a bit OP, but that kind of combo is really only valuable in deathmatches or big games, not so much competitive games with gold. Eternal mostly only causes gameplay issues in deathmatches. My favorite house rule there is to only allow it to work once. So if Eternal is used in a deathmatch, the second sinking is permanent. Thanks for the comment and let me know if you have any other questions. 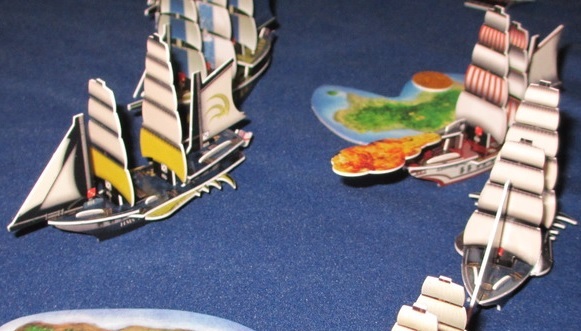 Captured Eternal ship carrying Davy Jones at the lower right after my Americans nabbed him in VASSAL Campaign Game 3 – click for details! A question was asked at the Facebook group – how do you repair broken masts? I do a simple tape job system. I rip off a very small slice of tape and put one on each side of a broken mast. It can still be a bit wobbly or fragile, but usually holds up fine and sometimes can even be taken out and replaced again as normal. If you do this I recommend the very clear tape and not what they might call “transparent” (which is more like a fog color I think). 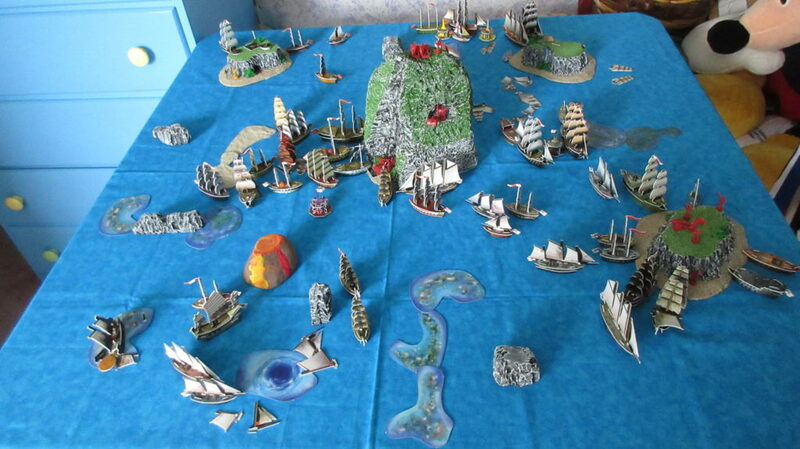 The few times I’ve tried glue with Pirates stuff it went horribly and I would almost rather just leave masts as-is than deal with any complicated or time consuming solutions. 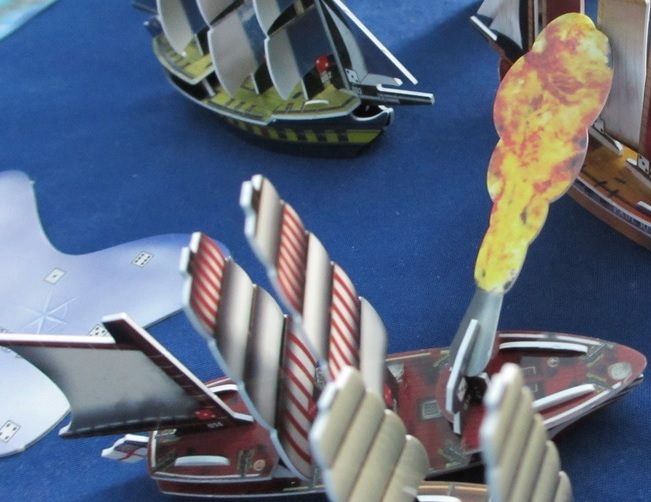 I have left a few ships damaged for a while (Concord from RV being the main one I remember) – as long as you can see the cannon die marking and there’s some sail, it can almost look cool like the ship is just permanently damaged (depending on the break of course). Check out this video I made about repairing basic mast breaks. This solution is especially great for repairing the typical break where you have a mast that has splintered near the base. 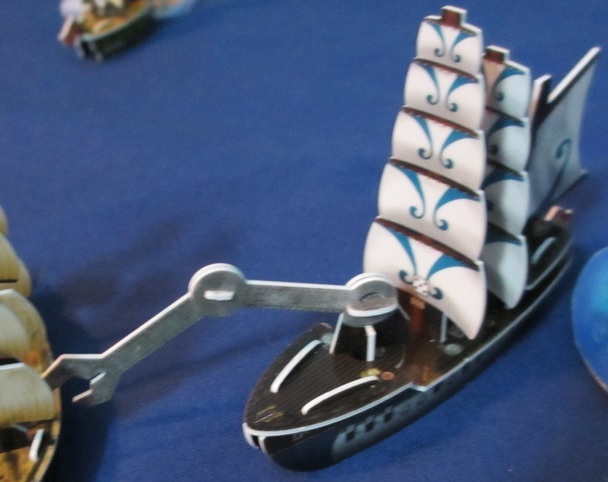 With a thin piece of tape carefully applied to both sides to hold it in place, you should have your ship back into action and sailing in no time! Question of the Day: How do you prefer to repair mast breaks? 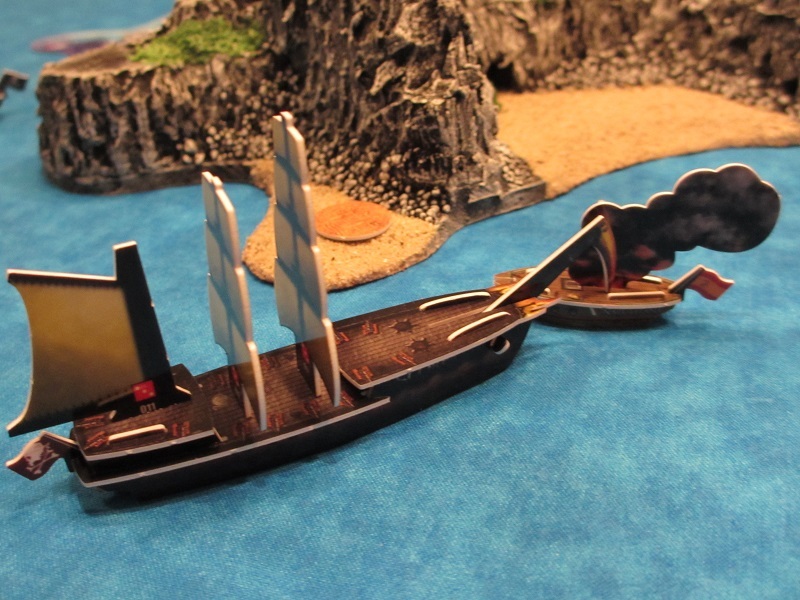 If you have multiple mast breaks, your ship is beyond salvaging, or you simply want to experiment with a different solution, you could repurpose a broken ship as a shipwreck! I created this Shipwreck Cove and it’s quite a neat aesthetic to have in games. 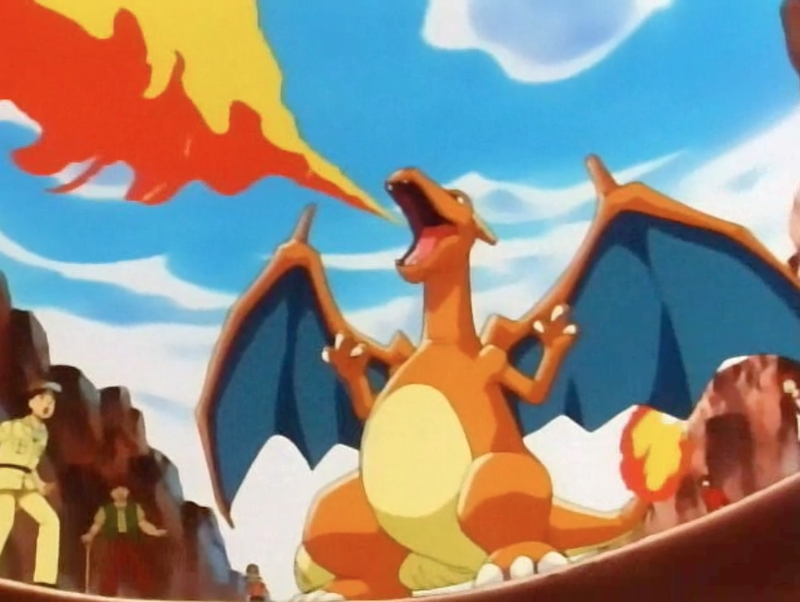 Please excuse my ignorance, but I see this term “pokeship” referenced from time to time on this site. What defines a pokeship? Is it good, bad, indifferent? Is there a set or sets in which they appear frequently? 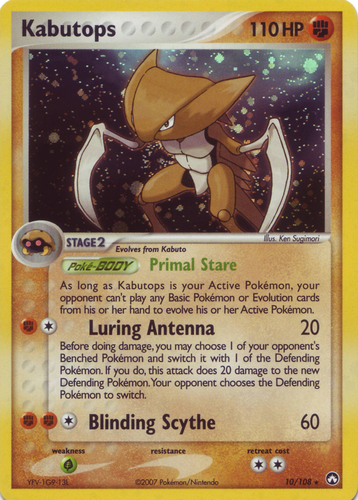 What are some examples of a pokeship? 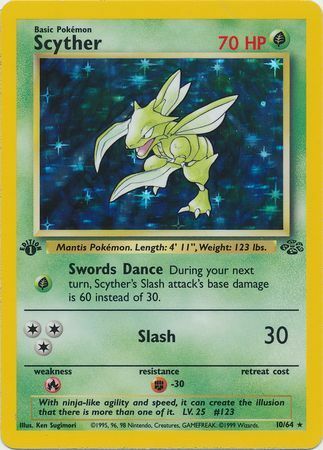 As far as I know the termed was coined by Holofernes back when the last sets were being released.